Handmade in Athens, Ga., by Dana Jo Cooley Art & Design. Dana Jo incorporates ten years of experience using a laser cutting & engraving machine into her traditional creative process. By blending her purist aesthetic with computer-aided technology, she creates one-of-a-kind pieces of art that seamlessly blend the old with the new. 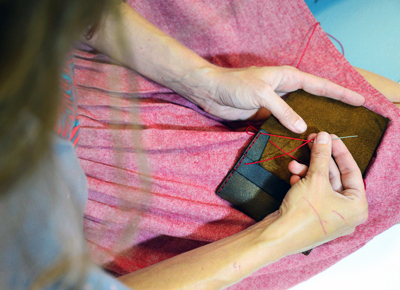 Dana Jo has been making leather goods for bands of all sizes, from Kishi Bashi and of Montreal to The Dave Matthews Band. To customize, please select the "Customize" option from the drop-down, and email us your text. Text is limited to 15 characters. These run in Small/Medium and Medium/Large. S/M fits wrists 5"-8" in circumference, M/L fits 8.5"-9.5". Brass button enclosure.